Well, aparently I'm not the only one and a quick google turned up several helpful sites. 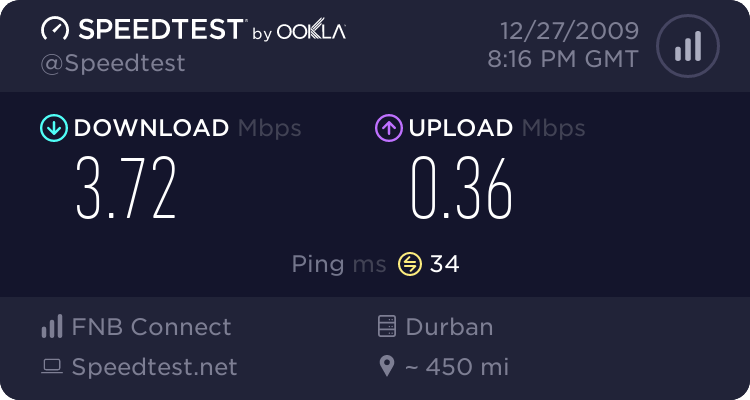 Random Speedtest - all is still well in ADSL land ! Screen is a wonderful tool. I use different configuration files for different scenarios, for example I regularly work on a set of database servers and I like to group them in a config file (for example ~/screen-dbservers). This typically displays a status line on the bottom. It's also in my ~/.screenrc file as the only two lines. You will notice I tend to keep my labels the same as the host names I'm connecting to - you may obviously prefer something else. Been working on gnome-terminal with the "Inconsolata" font for some time now - really cool! On Ubuntu, just "sudo apt-get install ttf-inconsolata" and then in gnome-terminal change the default profile (or another profile if you wish) to this font. Mine is set at "Inconsolata Medium 12".